We previously mapped mRNA transcript abundance traits (expression-QTL or eQTL) using the Barley1 Affymetrix array and ‘whole plant’ tissue from 139 progeny of the Steptoe × Morex (St/Mx) reference barley mapping population. Of the 22,840 probesets (genes) on the array, 15,987 reported transcript abundance signals that were suitable for eQTL analysis, and this revealed a genome-wide distribution of 23,738 significant eQTLs. Here we have explored the potential of using these mRNA abundance eQTL traits as surrogates for the identification of candidate genes underlying the interaction between barley and the wheat stem rust fungus Puccinia graminis f. sp. tritici. 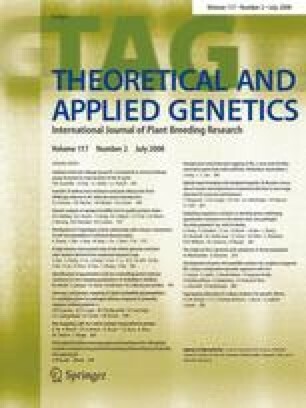 We re-analysed quantitative ‘resistance phenotype’ data collected on this population in 1990/1991 and identified six loci associated with barley’s reaction to stem rust. One of these coincided with the major stem rust resistance locus Rpg1, that we had previously positionally cloned using this population. Correlation analysis between phenotype values for rust infection and mRNA abundance values reported by the 22,840 GeneChip probe sets placed Rpg1, which is on the Barley1 GeneChip, in the top five candidate genes for the major QTL on chromosome 7H corresponding to the location of Rpg1. A second co-located with the rpg4/Rpg5 stem rust resistance locus that has been mapped in a different population and the remaining four were novel. Correlation analyses identified candidate genes for the rpg4/Rpg5 locus on chromosome 5H. By combining our data with additional published mRNA profiling data sets, we identify a putative sensory transduction histidine kinase as a strong candidate for a novel resistance locus on chromosome 2H and compile candidate gene lists for the other three loci. The online version of this article (doi: 10.1007/s00122-008-0771-x) contains supplementary material, which is available to authorized users. This work was funded by a joint grant from SEERAD and the BBSRC (grant no. SCR/910/04: ‘Genetics of gene expression in barley’) to Robbie Waugh and Michael Kearsey and the EU FPVI project BIOEXPLOIT to Robbie Waugh and Arnis Druka.